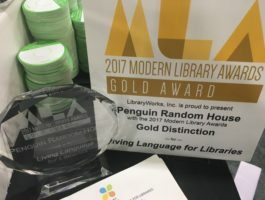 The Modern Library Awards are an annual unbiased program recognizing elite products and services for the library community. We are thrilled to announce that Living Language has been recognized with a Gold Award for 2017! 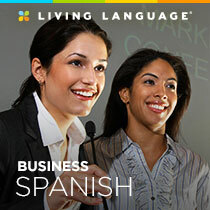 Learn more about Living Language’s offerings and how we can serve your community at www.livinglanguagelibraries.com. Living Language, an imprint of Penguin Random House, offers subscription-based digital language programs to public libraries. Originally developed for the U.S. State Department in 1946, Living Language learners benefit from 70 years of proven and effective language instruction in an engaging and easy-to-use digital format that helps them gain everyday conversation skills. No gimmicks, no tricks. More than just phrases, Living Language’s culturally rich and visual content in more than 45 courses (and counting) provides any patron with the chance to grow more confident in his or her language of choice. Patrons can access three levels of study for all core languages, as well as explore unique offerings such as: Passport Courses created for travelers; ESL courses; Business Courses; American Sign Language; and our On the Job series with content created especially for librarians, law enforcement, and healthcare workers. We are also the exclusive publisher of the Dothraki language course from HBO’s hit series, Game of Thrones. All of our courses use the Living Language Method ™, a four-point approach to effectively teach and reinforce vocabulary, grammar, comprehension, and speaking skills. In addition, Living Language offers each library account the vital resources they need to serve their community including colorful digital and print marketing materials, customer and technical support, and usage tracking. 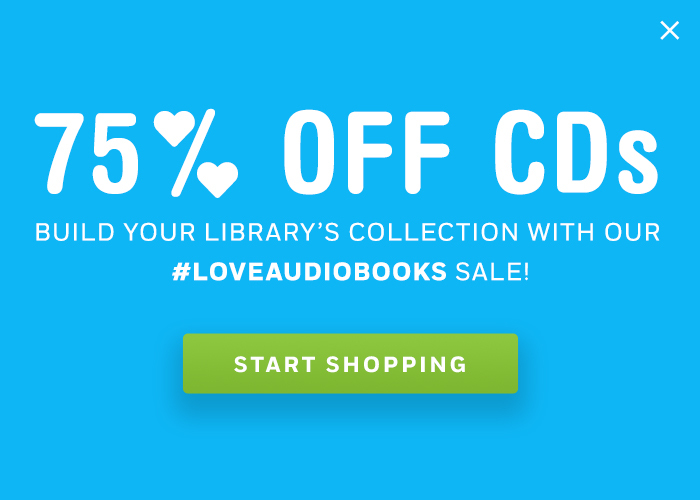 Exclusively distributed in partnership with bibliotheca. The perfect solution for patrons who are learning American Sign Language to communicate with their Deaf family, friends, or simply to enrich themselves by learning another language. 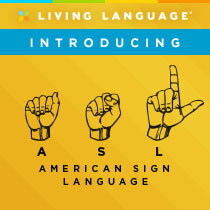 This Living Language course was created by native ASL speakers to give patrons the fundamentals of American Sign Language (ASL), from basic vocabulary and handshapes to more complex grammar and culture. The course includes 7 lessons of essential ASL phrases and vocabulary, video flashcards, grammar notes with video examples, games, video dialogues, and valuable cultural information. Click to watch a video and learn more about our ASL program. Developed by librarians and American Sign Language (ASL) experts, Living Language’s American Sign Language for Librarians is an essential tool for reaching out and communicating with your Deaf patrons and developing your library sciences career. Topics covered in American Sign Language for Librarians include: Welcoming New Patrons; Getting to Know the Library; Accessing Digital Resources; Programs at the Library; and Accessibility at the Library. Whether patrons are traveling to Vietnam or want to connect with Vietnamese speakers in their communities, Living Language has the programs to learn effectively and efficiently. Using the Living Language Method™, Essential Vietnamese teaches patrons everything they need to build a solid foundation so that they can speak off-script, not just memorize vocabulary words. Games and quizzes help reinforce the language taught in all 10 lessons. For more information on how you can bring Living Language to your library, please contact your Penguin Random House BOT Library Representative or visit www.livinglanguagelibraries.com.